Is it bad that I expect to get free bread now? It’s definitely something I judge the restaurant by. And it’s usually the first thing that’s presented, and you don’t get another chance to make a first impression. I appreciated that the bread rolls were still warm. One had a harder crust than the other, which was overall chewier. The insides were soft for both. 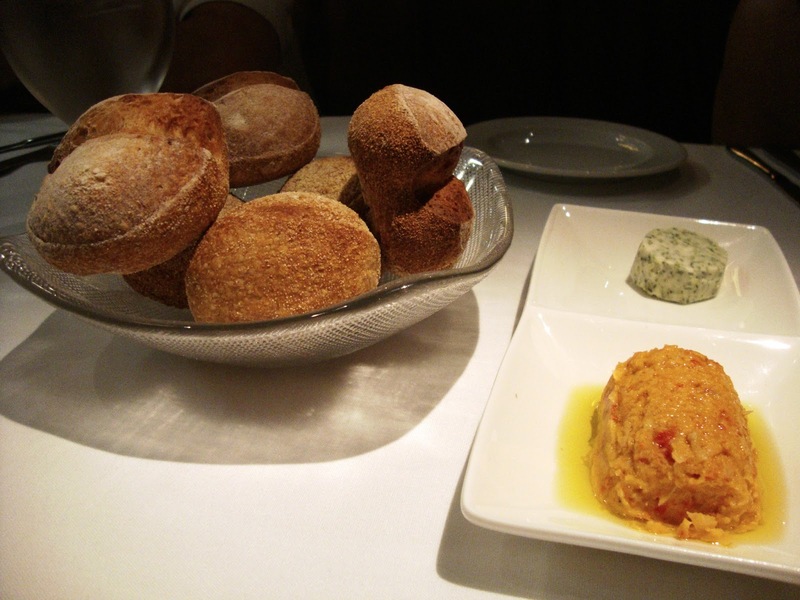 It was served with seaweed butter and red pepper hummus, both of which were mild in taste. Oh yes, there is no amuse-bouche. My bouche was not amused. 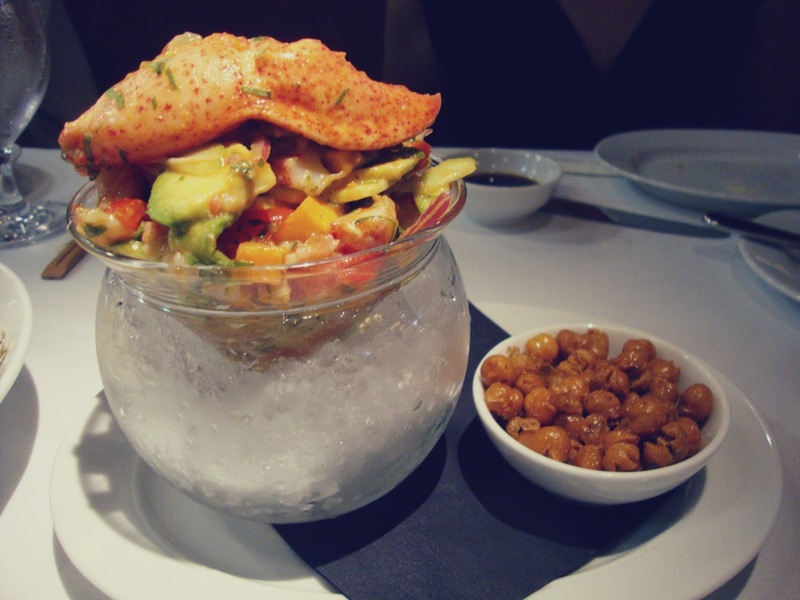 Atlantic Lobster Ceviche with crispy spiced garbanzo beans. The flavours again, were mild– not too acidic tasting, which surprised me. The avocados, as always, added a delightful creamy element. 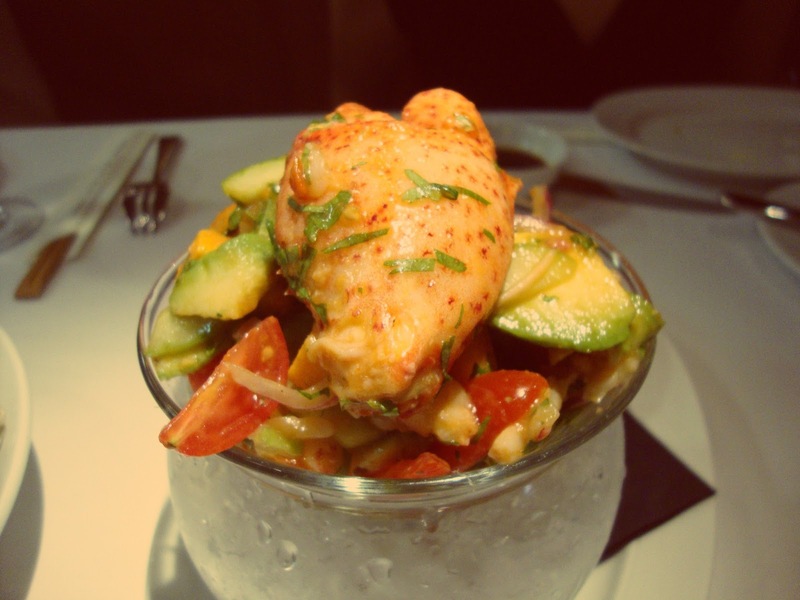 With ceviche I had been hoping that the lobster was more on the raw side, but it seemed fully cooked (far from being overdone, though). Nothing spectacular or too memorable, though. Oysters on ice: Satori (slightly salty, plump, medium sized, sweet flavour) and Read Island (plump meat, rich and mildly salty flavour). Served with mignonette, lemon and horseradish to enhance the flavour. It was tasting the sea in one bite. And the difference in taste between the two varieties is discernible! Oyster connoisseurs probably exist out there, who knew? According to our server, the restaurant gets oysters from the East coast flown in by plane daily (is that sustainable…), and all oysters are opened right before serving. 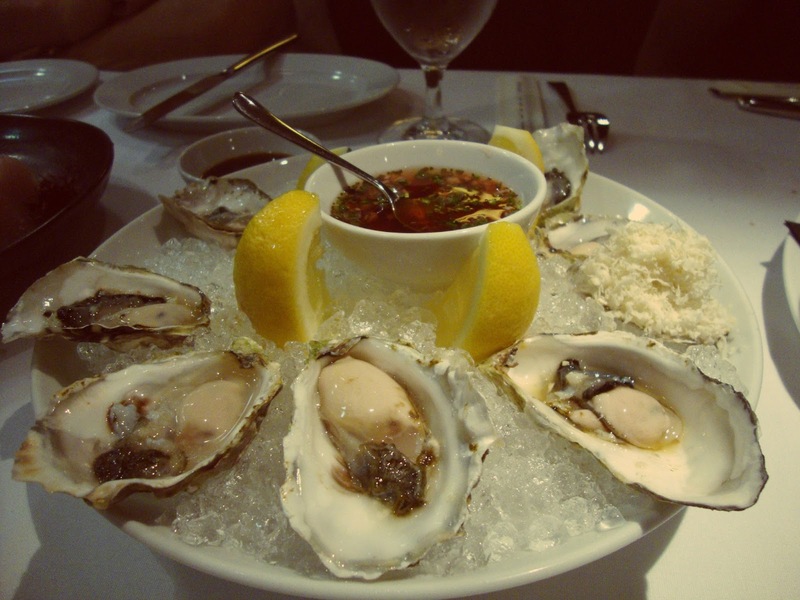 Oysters from the Atlantic are plumper, but West Coast Oysters are more flavourful. Toro (tuna belly) sashimi. A must, trust me. Melt in your mouth freshness. I had a moment to myself with my eyes closed when I ate this and I died. And when I opened them my mom was staring at me. Sigh, it’s so hard to understand me, right mom? 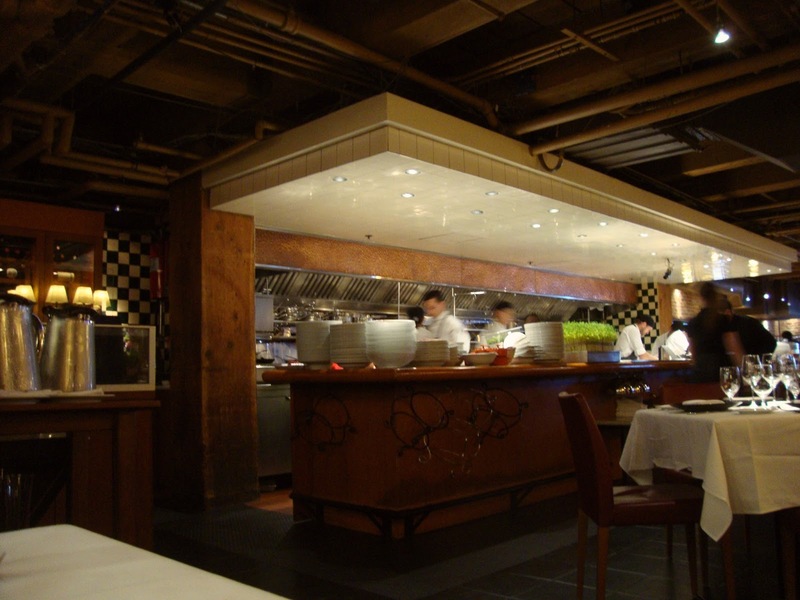 The open kitchen definitely enhanced my dining experience. Actually, I’d love to see the chefs cook our dishes, from beginning to end. 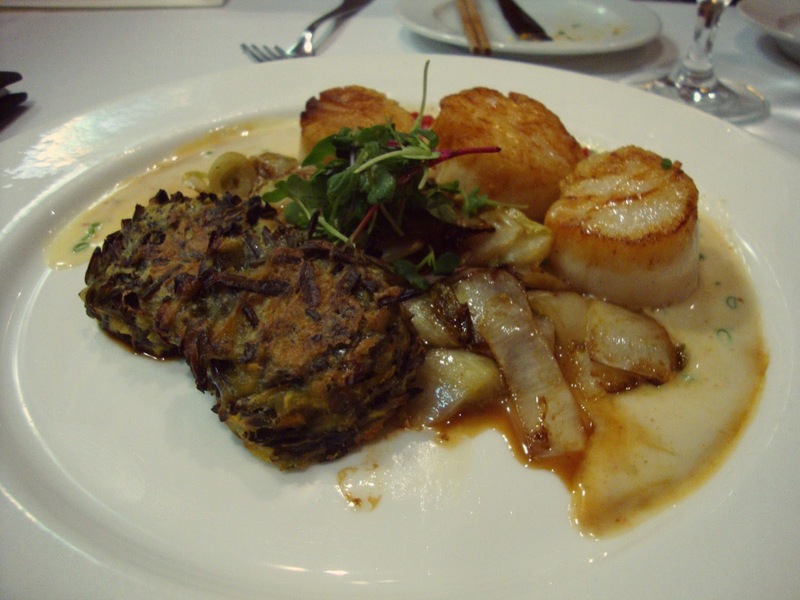 Qualicum Bay Scallops (caramelized belgian endives, wild rice griddle cakes, candied ginger and citrus sauce). You think you’ve had scallops before, maybe even very good scallops cooked juuuust right. My brother pan-fries scallops from Costco pretty well, and we thought there was little point in ordering something we could easily make at home. We were brought down from our scalloped high horse. These were shockingly juicy– I wish I knew how they did it. Maybe it’s the difference between cooking fresh scallops as opposed to thawed ones? Or did they poach and then lightly fry them? The griddle cakes were alright but not memorable; I ate the components separately so I can’t really comment on how the elements worked together. 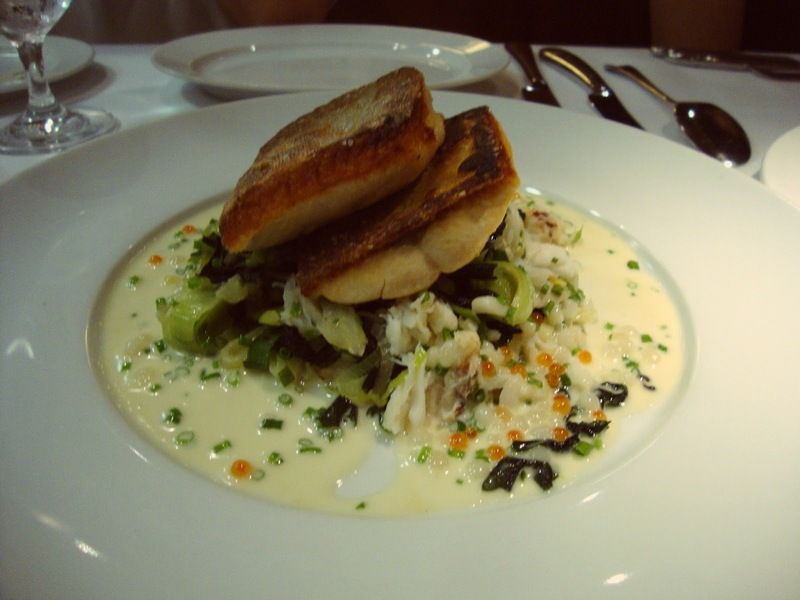 Arctic Char (braised leeks, wakame seaweed, dungeness crab, noilly prat beurre blanc with trout caviar and pearl couscous). I’ve never had Arctic char before, but the taste and texture reminded me of salmon. The flesh of the char was juicy, contrasting nicely with the crisped skin. 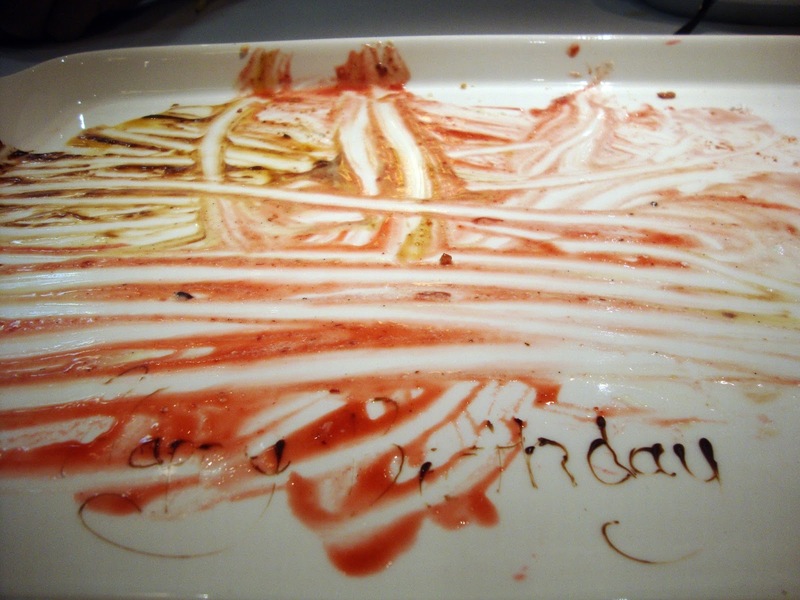 What was truly memorable about this dish was the sauce. We knew it was a butter-based sauce, but there was a savory dimension that we couldn’t identify. It was so noticeably special that my brother asked my dad (a cook/chef) what he thought it was. Not realizing this, I asked the same question a few moments later. I thought they used the pan drippings of the fish, but Michael pointed out that the sauce couldn’t be white if they did. Hashtag logic. I came home and looked at the menu again… maybe I should try making some buerre blanc with noilly prat. 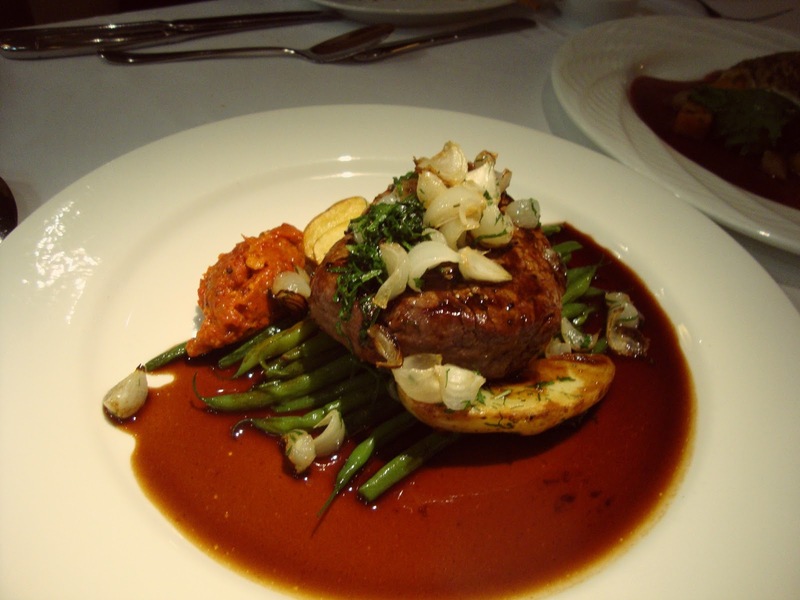 Beef Tenderloin (fingerling potatoes with rosemary and fleur de sel, fine beans, romesco sauce, red wine reduction).This dish looked so perfect that I thought I was eating a fake plate of food. You know, the samples that look so good you could almost eat it. And eat it I did. Usually I stick to a pescetarian diet, so the gaminess of the tenderloin was unexpected for this long-time fish eater. As expected it was juicy and tender, but it’s so hard for me to like red meat now; I can’t judge it fairly. 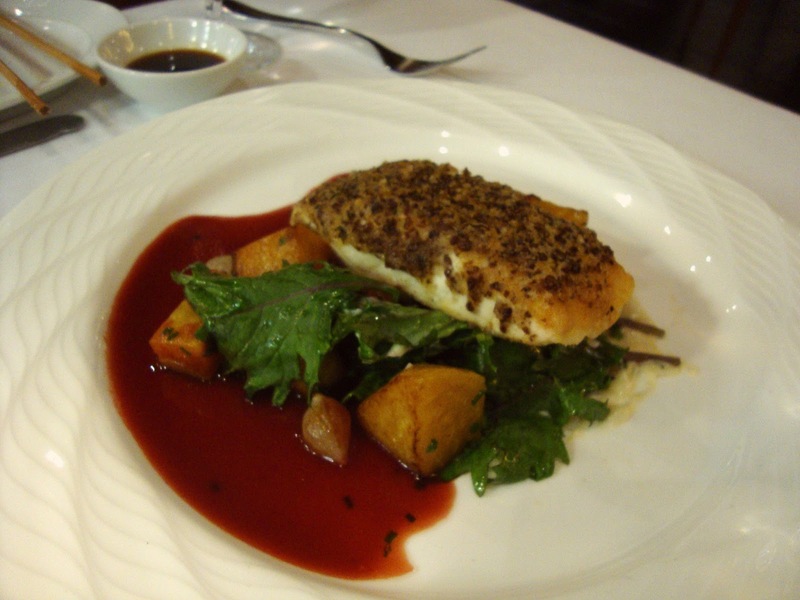 White Sturgeon (pumpernickel crust, cauliflower puree, roasted golden chioggia beets, garnet beet agro dolce). We ordered this, having never eaten sturgeon. After our initial disappointment in what seemed like a lack of juiciness (compared to the other plates), we realized it was probably the fish itself. 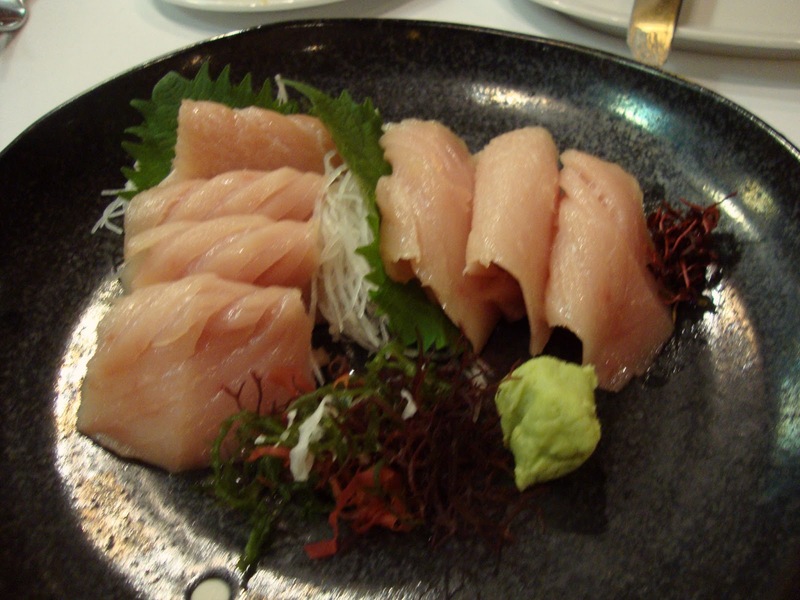 It’s not a fatty fish; it’s quite meaty and substantial in texture. While I enjoyed the sweet golden beets, I wished there was something creamy to balance out the chew of the sturgeon. Perusing the dessert menu after a satisfying dinner is one of my favourite moments in the world. 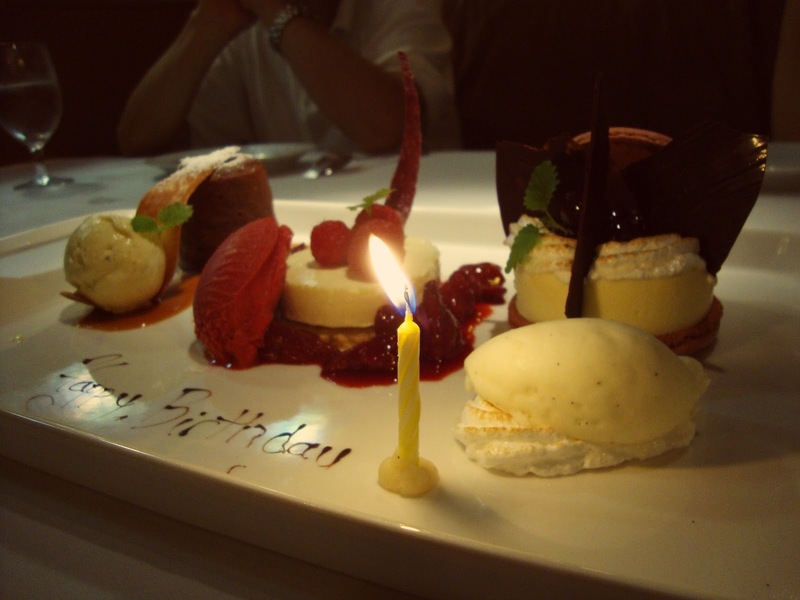 You’re happy from your mains, but there’s still that anticipatory excitement while waiting for dessert. Warm Dark Cuban Chocolate Cake (brandy truffle center, vanilla bean ice cream). 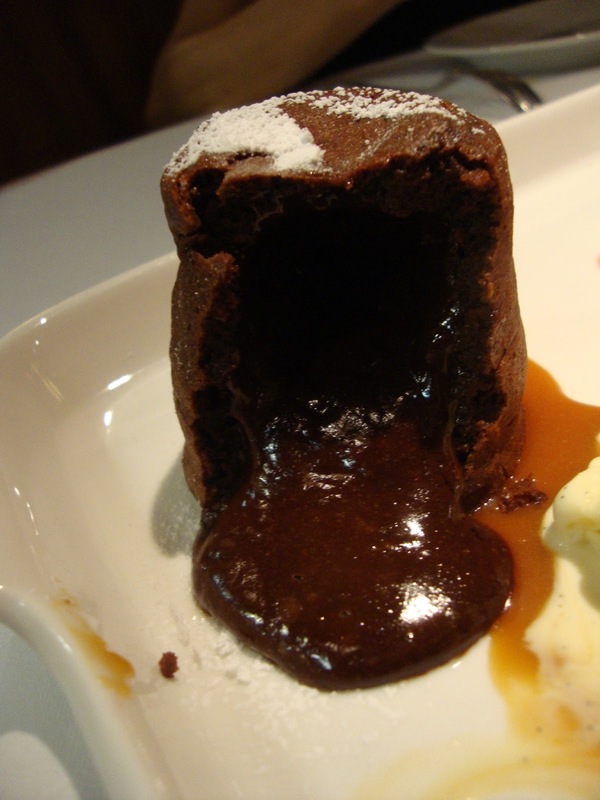 I haven’t met a molten chocolate cake I haven’t liked. The only thing different about this was the brandy, which just gave it the taste of alcohol… obviously, Colleen. The bitterness was a different sort of bitter than the chocolate, so it added another dimension in taste. It’s funny how both Michael and I tasted the ice cream and said that it was vanilla bean ice cream, not just vanilla. I have no idea how those vanilla seeds could taste any different than vanilla extract/flavour, but it did. Yuzu Cheesecake (roasted strawberry compote, raspberry coriander sorbet). I’ve never eaten yuzu by itself, but the cheesecake just had a nice citrus tang to it. The crust was certainly different– I had trouble breaking it with my fork. Not necessarily in a bad way; it resembled more of a cookie than a crust made of cookies. That’s right, no soggy bottoms! I appreciated that contrast in texture. Black Forest Macaron (cocoa macaron, white chocolate mousse, griottines, chantilly gelato). My mom asked what the macaron shell was, to which Michael replied, “the cookies Colleen cried over”. Not so long ago I was baking macarons, and my mom opened and closed the oven door ungently in the middle of the process. And the whole batch of it was “ruined” (ie. cracked). I was just super high-strung because I was preparing for my piano exam, so I might’ve gotten a tad bit more upset than what was called for. But I digress– the macaron was chewy as all macarons should be, but it wasn’t crunchy-crispy on the outside, which was disappointing. I almost got drunk off the griottines, but at least their bitterness was juxtaposed against the sweet mousse. I love how they’re balanced in terms of taste, texture, temperature, colour. 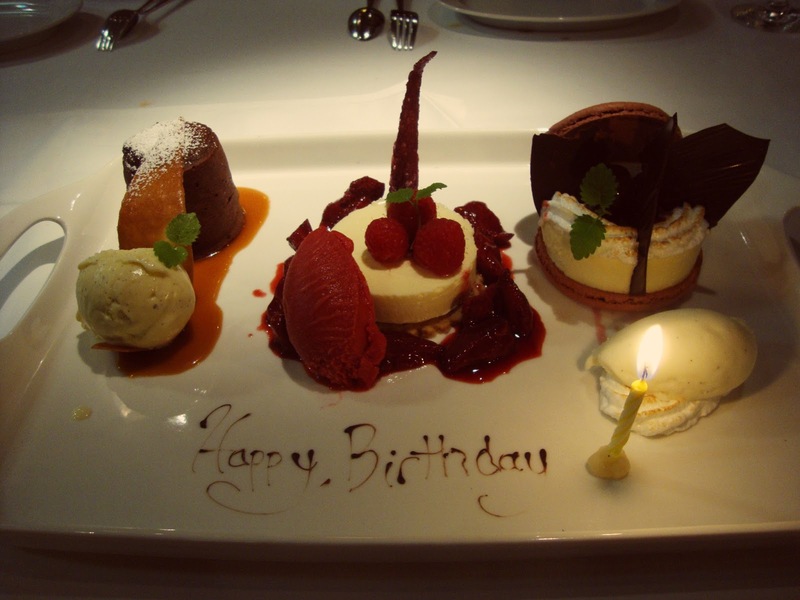 Each dessert had a sorbet or an ice cream; each dessert was garnished with those tiny green leaves. I’d come to Blue Water Cafe for their desserts alone. 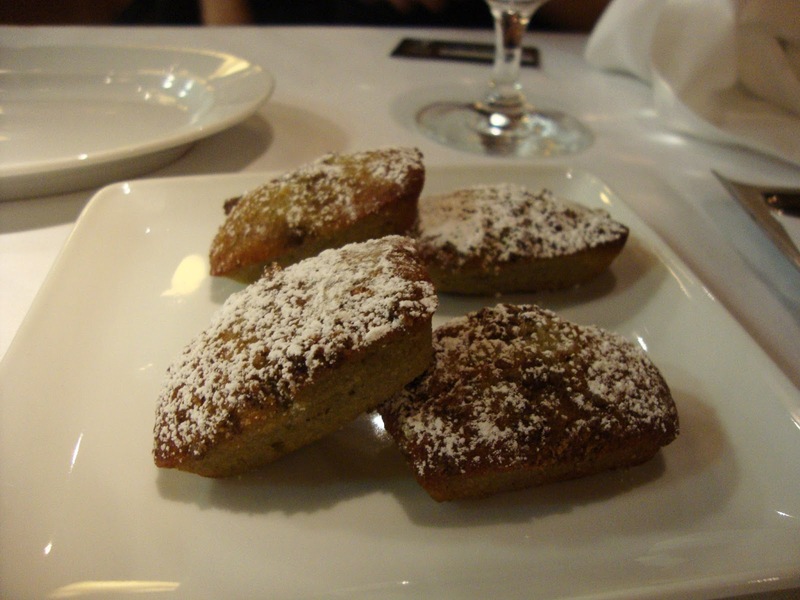 Pistachio financiers were the complimentary petit fours that finished off this truly impeccable meal. I’ve never baked financiers because I thought they might be dry, since it uses butter as its fat rather than oil. I’m going to have to bake a trillion financiers now in order to replicate this. 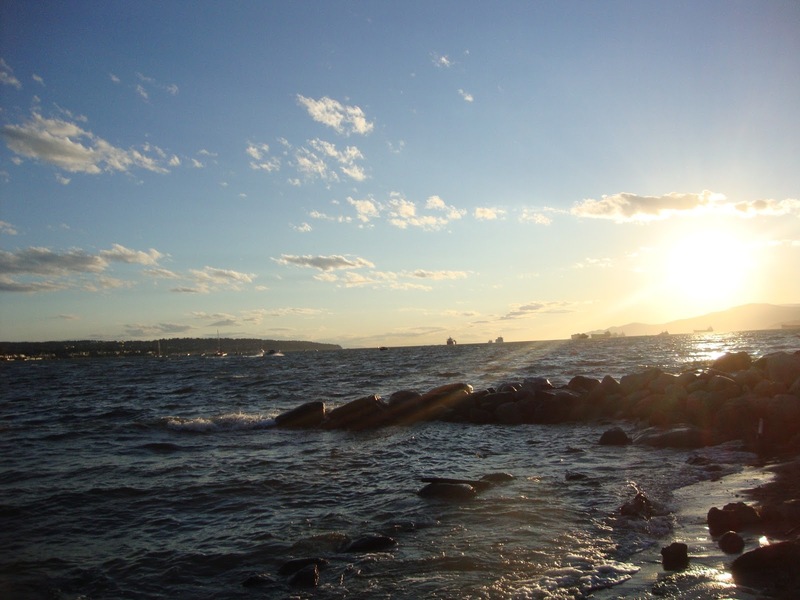 Watching the sunset? An even sweeter finish.